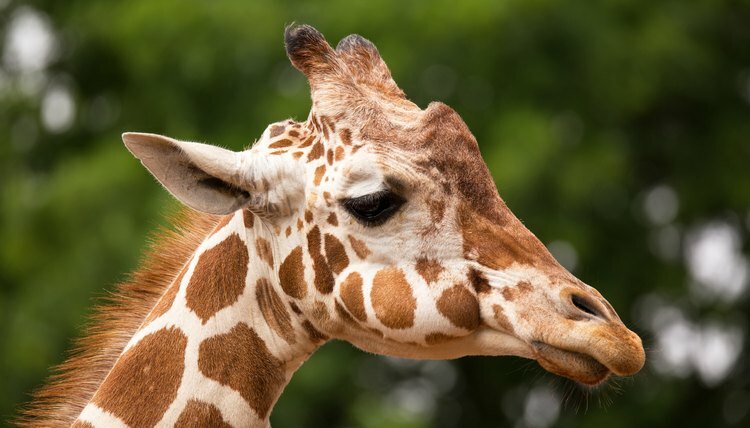 It's not only a giraffe's long neck that distinguishes him from other animal species, but also his distinctive spot pattern. The spot pattern on each giraffe is unique, although the different subspecies of giraffe are separated in part by the normal shapes of their spots. A giraffe's spot pattern is similar to one of our fingerprints. It's a unique identifier for each animal, helping other giraffes recognize who is in their family groups. Reticulated giraffes have the most complicated spot patterns of any giraffe subspecies, although it's often difficult for the untrained eye to distinguish differences between species or individuals. Each subspecies of giraffe has its own pattern style. Within those styles, each giraffe has his own distinct pattern. Although there is some disagreement in the scientific world about the exact number of subspecies, there are nine possible ones. These include Reticulated, Kordofan, Nubian, Angolan, South African or Cape, Rothschild’s or Ugandan, West African or Nigerian, Thornicroft’s and Masai. All are immediately recognizable as giraffe spots, but some stand out a bit more from the other subspecies' patterns. Angolan giraffes, for example, have notched indentations in most of their spots. Rothschild's giraffes have wavy edges on their spots and are a solid cream color below their knees. Masai giraffes have spots that resemble oak leaves, with deep, rounded indentations. Spots make giraffes easy to spot in a zoo setting, but it works as a type of camouflage in the wild. They live mostly on African savannahs, full of tall grasses and trees that provide dappled shade. The random spots help them blend in with the moving shade patterns, making them more difficult for predators to identify. While all giraffes are shades of cream and brown, the colors vary significantly by subspecies. For example, Masai giraffes are the darkest, with spots that appear almost black. The lighter color between the spots also is darker than that of other giraffes. Reticulated giraffes have dark brown spots with tiny lines in between -- narrower lines than other subspecies. This creates a web-like effect, and it makes them appear darker than some other species. Angolan giraffes sometimes are described as "smokey" because they are so light in color. The cream lines between spots are darker than some other giraffes, making them a bit harder to distinguish from the spots. The color differences tend to reflect the color of the vegetation in the area the giraffes typically live.